Garlands are often an overlooked Christmas decoration, but their charm and simplicity make them the perfect addition to your home for the holidays. Plus, they’re easy to make yourself and customize to your liking. Because the Christmas season screams DIY, we rounded up a few of our favorite homemade garland projects. Make and hang these around your tree, over your staircase railing, mantel, or doorway. Do you have leftover felt scraps lying around from your last few craft projects? Recycle your scraps into something pretty and whimsical! This colorful garland idea can be customized to any color palette—so whether you prefer traditional Christmas colors or a pretty rainbow, anyone can DIY this easy holiday garland. The holiday season is full of whimsy, so it’s decorations should follow suit. Have extra gumdrops after building your dream gingerbread house? Follow this tutorial to make a colorful candy garland! There’s something so sleek and modern about this garland. Some clever cutting will give you these geometric mini trees, which you can then string together on Baker's twine—the whole project can be completed within an hour! The more budget-friendly the DIY project, the happier the crafter! Stock up on colorful paint chip samples at your local hardware store to create fun garlands for next-to-nothing. This chic snowflake garland looks store-bought! Go ahead, keep this one up all winter long. Snowflakes never go out of style (at least from December to March, they don't!). This DIY says it all. It’s easy to make, adorable, and only requires a few easy-to-find supplies. Plus, it looks great wherever you decide to hang it. Burlap is versatile, simple, and adorable. It’s our favorite material to work with while creating DIY projects, especially during the holidays. This craft uses burlap to create a cheerful Christmas garland perfect for draping across the fireplace. No green thumb is needed for this cute craft. This DIY paper leaf garland will instantly brighten up your space. The supplies for this craft are so simple, you probably already have them tucked away somewhere. By the time you’re done, you’ll be an expert pom-pom-maker. Studies show including plants in your home is a mood booster and natural air purifier. Here’s a great way to reap the benefits of plants while creating an adorable decoration for guests to muse at. Colorful paint chips can be used to create virtually any garland you want. Here’s a few creative options. What do tangerines, navel,s and blood oranges have in common? Well, besides the obvious fact that they’re all from the citrus family, these fruits come into season in the winter months. This craft is a lovely way to showcase the fruits of the season. This tutorial will show you how to create a beautiful wreath-meets-garland holiday decoration. Make multiple to add elegant layers of holiday cheer around your home. Head to your pantry to find all the supplies necessary for a beautifully-scented and budget-friendly holiday garland. This craft is an excellent excuse to open that bottle of wine you’ve been saving. Collect the corks from all your favorites and create a one-of-a-kind upcycled cork garland to decorate your Christmas tree. You don’t have to flex your artsy muscles too hard for this DIY project. Use the free printables provided in this tutorial for a festive and glittery garland. A little bit of elbow grease (and power tools) will go into this DIY, but we promise the end result is worth it. Just look at those colorful beads! You can’t have Christmas without twinkly lights. Kick yours up a notch by adding pretty accents like the ones shown in this tutorial. Who says Valentine’s Day gets all the heart-shaped decor? 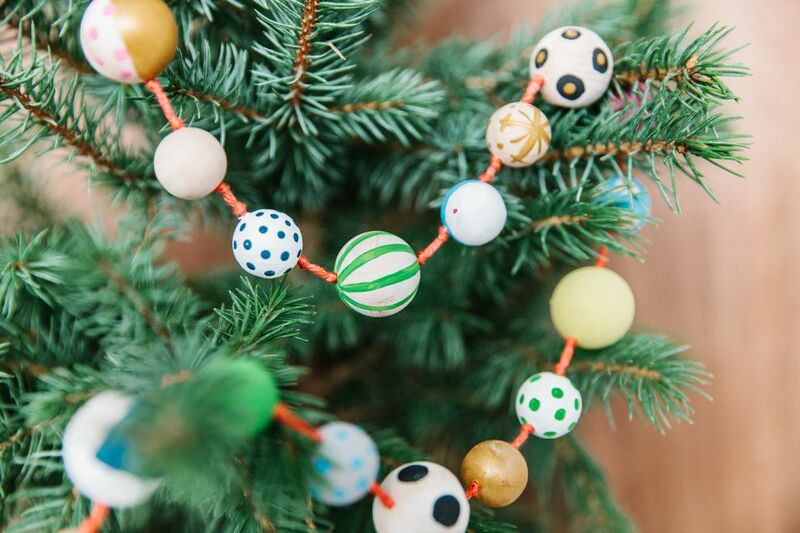 This cute garland will work for any holiday. Still not convinced? Use metallics and mix in some stars and other shapes to make it feel more holiday-friendly. The wonderful thing about DIY is that projects can be easily customized to fit your space and personality. You’re sure to find your new favorite decoration with these five variations on a DIY garland. Greenery and a simple floral arrangement can give every space a lively holiday boost. Use this DIY garland to decorate an item—like with the mirror demonstrated in this tutorial—or simply hang it on a wall or window. As long as you choose colors that complement your home, there’s no going wrong with this DIY. The in-depth tutorial for this tassel garland will make things easy. Not only is this DIY garland simple, it’s budget-friendly! Play with inexpensive and easy-to-find felt squares to create this adorable string of felt balls.